Coming October 9, 2014. Calling all cowgirls for a fun long weekend! Our friends at the Triple Creek Ranch describe this adventure as an… “all-women’s ride for ‘chicks’ only. 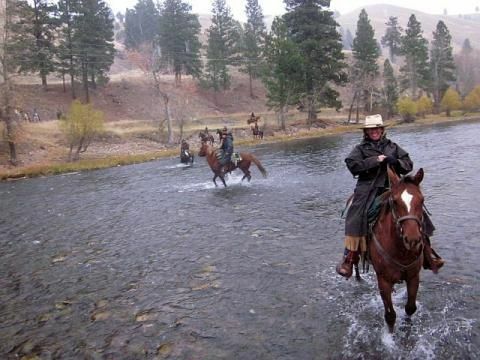 While traveling companions are welcome to the many exciting activities and luxurious accommodations Triple Creek Ranch has to offer; cowgirls will venture into deep canyons, over mountain passes, past crystal clear lakes and through pristine meadows to discover the ‘last frontier’ and wilds of the Rocky Mountain West. As the adventure progresses, riders return each evening to the ranch where the home fires burn and cocktails, gourmet food and luxury cabins await. Then after a restful night, cowgirls mount up and venture out for another day on the scenic ‘Big Sky’ frontier.” So saddle-up Trailblazer-“cow”-girls and join the adventure.